Congress has shown bipartisan support for Earth and space sciences in the past. Advocates hope it will do so again. The U.S. federal budget proposal for fiscal year (FY) 2018, which the Trump administration released yesterday, slashes funding for many federal science agencies. Attention now turns to Congress, which appropriates funding for federal agencies. Scientists and environmental advocates say that the proposed budget, which the administration billed as a funding plan to “make America great again,” would weaken the country economically and reduce public health, safety, and environmental measures. They hope that Congress will muster continued bipartisan support for Earth and space sciences, just as it did earlier this month in passing omnibus legislation to fund the government through FY 2017, which ends on 30 September. President Donald Trump signed that legislation into law even though it sharply contrasted with his FY 2018 “skinny budget” released in March that preceded the fleshed-out FY 2018 budget unveiled yesterday. As the skinny budget had foreshadowed, the full version of the FY 2018 budget proposal will dramatically cut discretionary funding compared to the FY 2017 budget to offset increases in military funding and other administration priorities (See Table 1). “The White House’s 2018 budget plan, if it were to become law, would devastate America’s science and technology enterprise and negatively affect our nation’s economy and public well-being,” Rush Holt, CEO of the American Association for the Advancement of Science in Washington, D. C., said in a briefing held by the association on Tuesday. aSources: Budget of the U.S. Government: A New Foundation For American Greatness—Fiscal Year 2018; American Geophysical Union Public Affairs Department analysis. The budget for the National Oceanic and Atmospheric Administration (NOAA) would drop to $4.775 billion, down 15.9% from the FY 2017 budget. At NOAA, steep cuts would hit the Oceanic and Atmospheric Research Office, including that office’s Climate Research Program; the National Ocean Service; and the National Environmental Satellite, Data, and Information Service. Lautenbacher served as NOAA administrator from 2001 to 2008 under President George W. Bush. He is now the CEO of GeoOptics, a Pasadena, Calif., company developing a constellation of small satellites to collect climate and environmental data. The Environmental Protection Agency (EPA) would receive $5.700 billion, down 29.3%. Within EPA, funding would discontinue for more than 50 programs, including the Obama administration’s Clean Power Plan to limit power plant emissions, international climate change programs, and climate change research and partnership programs. 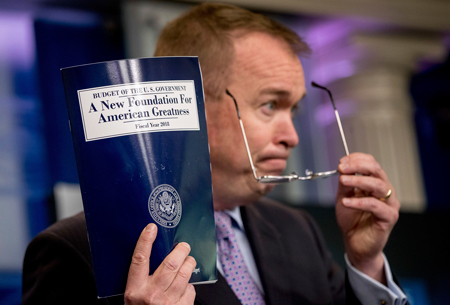 White House Office of Management and Budget director Mick Mulvaney said that the administration is “absolutely not” antiscience, despite cuts to science agencies and climate change initiatives. “We’re simply trying to get things back in order to where we can look at the folks who pay the taxes and say, ‘Look, yeah, we want to do some climate science, but we’re not going to do some of the crazy stuff the previous administration did,’” he said. The National Science Foundation and the U.S. Geological Survey also would lose ground under this budget, as would Earth sciences within NASA. Although the budget for NASA planetary sciences would increase 4.5% under the proposed budget, the plan basically instructs NASA “to stop looking at Earth and look at other planets,” said David Doniger, director of the climate and clean air program of the Natural Resources Defense Council, which is headquartered in New York. Upcoming Eos stories will provide additional coverage of the federal budget. Editor’s Note: AGU, which publishes Eos, issued a statement yesterday about the Trump administration’s FY 2018 budget request. The proposal “charts a course of destructive under-funding for scientific agencies,” writes AGU executive director and CEO Christine McEntee. Citation: Showstack, R. (2017), Federal science funding drops sharply in Trump budget plan, Eos, 98, https://doi.org/10.1029/2017EO074583. Published on 24 May 2017.